The Chicago Book Online Business Profile -- Savage Bros. Co.
Savage Bros. Co. is fully entitled to the tagline it uses in its logo: "A 21st Century Company . . . with 19th Century Craftsmanship." For over 150 years, Savage Bros. has concentrated on producing quality confectionery equipment used for making candy and chocolate. Although the company now designs machinery that is powered by electricity and gas instead of wood and coal, it still draws on the same innovation and attention to detail as it did back in the days when its copper kettles were pounded out by hand. Savage Bros. was founded by siblings Richard and Edward Savage in 1855, making it one of the oldest companies in the Chicago area. The company stayed under family ownership for 120 years, all the while designing and producing a wide array of machines for candy-makers. By 1975, however, the Savage family's current generation had unfortunately not produced any descendants to carry on with the business, and the company itself had declined to only a few employees. The sole remaining Savage family member, who was in her seventies, offered the company to a group made up of two families and certain key employees headed by two enterprising young businessmen named David Floreani and Bob Parmley. Floreani and Parmley had originally intended to purchase some of Savage Bro. 's plant machinery for the lawn care business they had started together after leaving the Air Force in 1972. They became excited about reviving the venerable Savage Bros. brand and were actively involved in running both companies until 1987, when they sold the lawn care business to a national corporation and devoted themselves full-time to the confectionery machinery industry. Parmley stepped into the position of president of Savage Bros. in 2011 after the death of his partner. When the current ownership took over Savage Bros. in December of 1975, they found they did not need all of the space offered by the four-story structure it had occupied on the west side of Chicago for over a century. In January of 1976, they relocated the operation to 7,500 square feet of rented space on Delta Lane in Elk Grove Village. By 1994, the company had expanded enough to move into 20,000 square feet of space in a shared building at 1125 Lunt Avenue in Elk Grove. In 1999, the now thriving Savage Bros. purchased the Lunt building and currently occupies the full 30,000 square feet, as well as an additional 6,950 square feet on Lively Boulevard used for assembly of its newest product line of chocolate enrobers and cooling tunnels. "Ask any candy-maker if they are familiar with the Savage brand, and they will most likely answer yes," says Bob Parmley. "The company's business roots are small to medium-size candy-makers who make and sell their own product such as fudge shops like those found in Wisconsin Dells, and local or national chocolatiers making boxed chocolates. Large international brands also purchase Savage machinery for research and development kitchens and specialized products." Other industries that find applications for Savage products besides candy-making include food processing, pharmaceutical, R&D (research and development), and artisan products such as candles, soaps, and cosmetics. Although Savage Bros.'s customers have traditionally come from the Chicago area, northwestern Indiana and southeastern Wisconsin, it is actually a global company. "Savage's active customer list is world-wide. Nearly twenty percent of the company's machines are shipped to buyers outside of the United States," Parmley explains. "Our customers range from multi-generation family businesses to large corporate entities to brand-new start-ups, and currently number several thousand. Not every customer is actively purchasing equipment every year, so the total customer base is considerably more. We respond daily to new inquiries from our Website, referrals, and our general reputation." 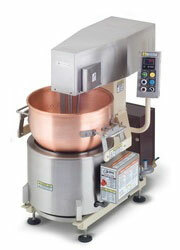 Savage Bros. currently brings in average yearly sales of nearly $7 million selling equipment such as gas and electric candy stoves; copper and stainless steel kettles; cookers and fire mixers for confections such as fudge, caramel, toffee, nougat, and brittle; cooling tables; bowl lift machines; and chocolate melters. The company's approximately 40 employees include a team of engineers who continually design new equipment based on the latest industry trends. Savage Bros.'s latest creation is a line of chocolate enrobers (which automatically coat fillings in a pre-determined amount and thickness of chocolate) and cooling tunnels (an extension of enrobers in which jets of air are used to cool the candy and solidify the coating prior to packaging). The company's signature product is its "FireMixer," a combined cooker and mixer used to make virtually any cooked confection which has been used by the candy-making industry in some version since 1903. The current models of the FireMixer include the Warrior, which comes with a spring-loaded scraper agitator, and the Chief, with a counter-rotating second agitator. Both models are available in gas or electric versions. Savage Bros. weathered the recent recession well and worked hard to successfully retain its entire workforce. "While the making and selling of chocolate and candies did reasonably well during the recent economic downturn, it did not necessarily convert to the purchase of new capital machinery," says Parmley. "Savage, however, fared well during the recession by introducing some new products, updating the technology of established products, and extending itself to manufacture more custom made-to-order machines. We utilized the same kind of quality products and customer service that enabled us to rebuild the Savage brand in the first place."